www.photomacrography.net :: View topic - Life is looking up for this tiny male mayfly! Life is looking up for this tiny male mayfly! 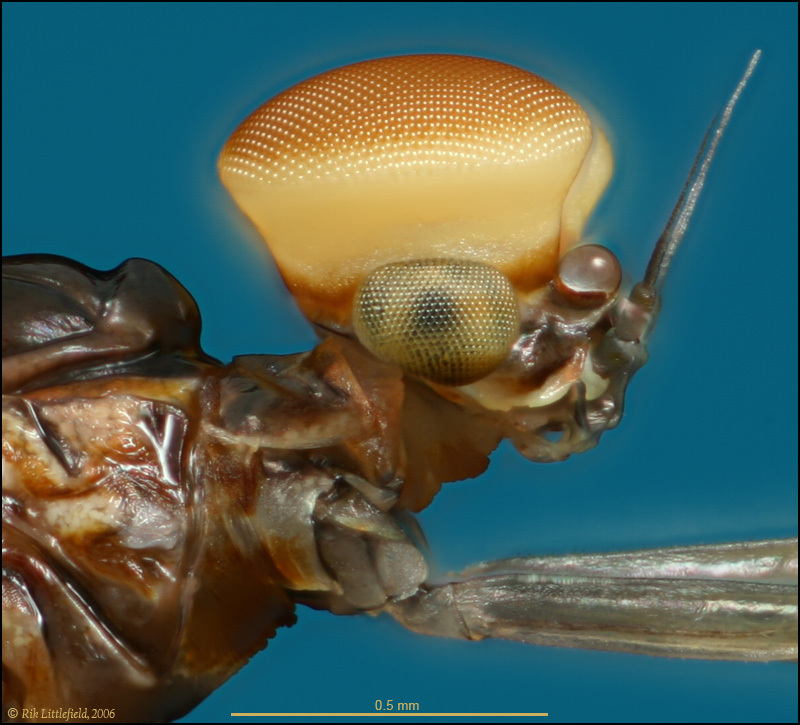 Posted: Wed Aug 09, 2006 10:07 pm Post subject: Life is looking up for this tiny male mayfly! In both of the above pictures, you can see a dark area of the eye, where the camera was looking close to straight into the ommatidia. In the lower "normal" eye, this area is small; in the upper "searchlight" eye, it is large. This directly corresponds to the different structures of the eyes. The lower eye views a large area, so the camera looks small (and the dark spot looks small to the camera). The upper eye views a small area, so the camera looks large (and the spot looks large to the camera). Here's a closer crop of the first picture, so you can see more of the detail that I find fascinating. Technical: These pictures were done using Canon Digital Rebel, Olympus 38mm f/2.8 macro lens on bellows at f/2.8, deeply stacked (~100 frames) using Helicon Focus, no manual cleanup, 0.0005" focus step. Halogen fiber optic illuminator with Krebs-style pingpong-ball diffuser and backlighting. Fantastic shots Rik! Great work. These are excellent! Being a fly fisherman and tyer, I find mayflies to be among some of the most beautiful insects and they are fun to tye immations of. I have never seen or more than likely not noticed the eyes of a mayfly like this. so how DID you hold them? I can immagine that poor fly flayling around like crazy unable to get away. Yet you get a whole set of images to process in Hlicon. So spill the beans bub, or I'll have to send Guido after you. I didn't know olympus made a lens that fits a Canon camera. Do you have a pic of that setup? I am so utterly amazed by your photo. The image is so clear and detailed. Firstly the stacking tecnique, really does a good job. I can see that some clean up could be done from frames that e.g. has the legs way out of focus. Would love to try this stacking out one day. 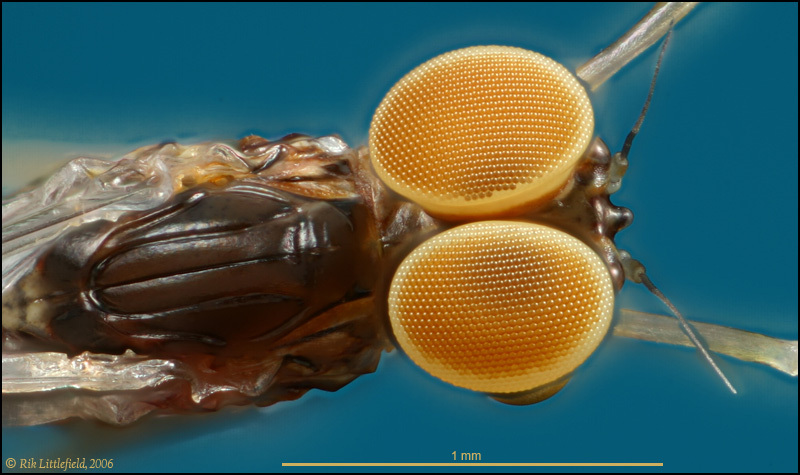 Secondly the insects eyes are the most crazy thing I've ever seen. This mayfly must have a big need to look with details in one direction, upward. Guess it's needed to find a mating partner. Good idea to put the scale at the bottom og the images. so how DID you hold them? Forceps, Carl, forceps. And some anesthesia. About the forceps, see the setup described here. About the anesthesia, well, this mayfly actually held pretty still when I just immobilized its wings, but not still enough to shoot these pictures. I was able to get 10-frame stacks without anesthesia, but to get 100 I had to use some serious chemistry, and what I had handy was ethyl acetate. (I confess, at least one mayfly died to get these shots. ) 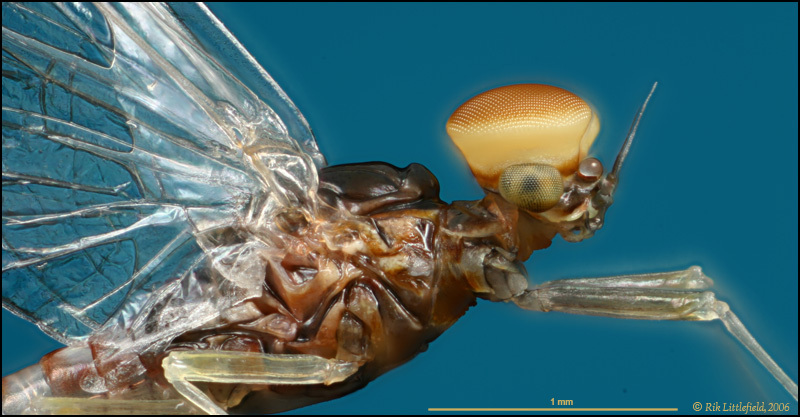 I already had the subject mounted in the photo setup, so I applied the ethyl acetate as a liquid to the abdomen. It evaporates quickly from exposed surfaces, but I see in looking again at these pictures that some of the liquid may have wicked between the wings and not yet evaporated when I shot the stack. Next time I'll try Charlie's CO2 trick, if possible. Firstly the stacking tecnique, really does a good job. I can see that some clean up could be done from frames that e.g. has the legs way out of focus. There is at least one pretty severe stacking error in these images, but it's hard to know without access to the original frames. Take a close look at the first and third pictures. The front antenna -- the dark one -- should actually be the same length and thickness as the back antenna, and should mostly hide it. But the stacking software does not understand front versus back, it just understands strength of detail. The back antenna has stronger detail (more contrast), so the software chooses to show that. This problem occurs in many stacks. As an algorithm developer I am annoyed by this, but apparently I am more sensitive to it than most people because I don't hear much grouching about the problem. I am so utterly amazed by your photo. The image is so clear and detailed....Good idea to put the scale at the bottom og the images. Thanks, Erland -- and everyone else -- for your compliments on these images. It's great to know that other people like them too! I'd viewed these early-on, before the discussion, and I see there's more to your immobilizing technique than the forceps. It's a difficult thing to deal with for this kind of work, unfortunately. Next time I'll try Charlie's CO2 trick, if possible. Can you explain what that trick is? Just blast them with some CO2 to knock them out?? CO2 is pretty commonly used as an anesthetic in genetic research studies of fruit flies. It will knock out most insects. If you have them in a small container, a short blast injected into the jar will usually do the trick. Ethyl acetate is one of the substances most recommended by entomologists for "killing jars". It is slower acting than some other substances used for this purpose, and if used carefully will put an insect "out" without killing it. Over on the microscope side of the forum we tend to look at very small pieces of insects mounted on slides. So the need for a dead specimen is obvious. In the "macro" realm this may be less necessary, but when you try to make detailed, illustrative pictures in the transition magnifications between photomacrography and photomicrography it will often become necessary as well. Think of the the difference between the kid who like to fry insects with a magnifying glass "just for fun", and the budding young naturalist that collects specimens and and carefully studies, catalogues, and annotates his collection. In both cases insects die, but I certainly see a difference. There's no doubt this is a bit of an uncomfortable issue that arises when doing this type of picture. ...Think of the the difference between the kid who like to fry insects with a magnifying glass "just for fun", and the budding young naturalist that collects specimens and and carefully studies, catalogues, and annotates his collection. In both cases insects die, but I certainly see a difference. Charlie, your words are as eloquent and graceful as your pictures! I'm intrigued by how odd it feels to be discussing this issue. On the lepidopterists' list that I frequent, the topic is simply forbidden. It's treated as a religious debate. The policy was firmly in place by the time I got there, but I suspect it's pretty wise. But since the topic is still OK here, I'll point out (once again) that the world is a complicated place. If you Google on "anesthetize Drosophila", and read through the hits, you'll fairly quickly find one that says "CO2 is the most commonly used anesthetic for Drosophila. This form of anesthesia was shown to cause cardiac arrest within a few seconds in Drosophila (n=10), with resumption of the heart beat 20 to 30 seconds after cessation of gas exposure." You'll also find another page that says CO2 has long term effects on behavior and should be avoided for behavioral studies, and another pointing out that different species and even strains within a species vary in their tolerance. The bottom line is that any time you do anything that affects an organism's behavior, you have to accept the responsibility for making that choice, even though you really can't know all the implications. Personally, I'm happy if people make thoughtful decisions on a case-by-case basis. By my own standards, killing a few milligrams of insects to make a beautiful and thought-provoking picture is much less troubling than the chicken salad that I had for lunch, or the probably thousands of insects that got killed or displaced the last time I mowed the lawn.